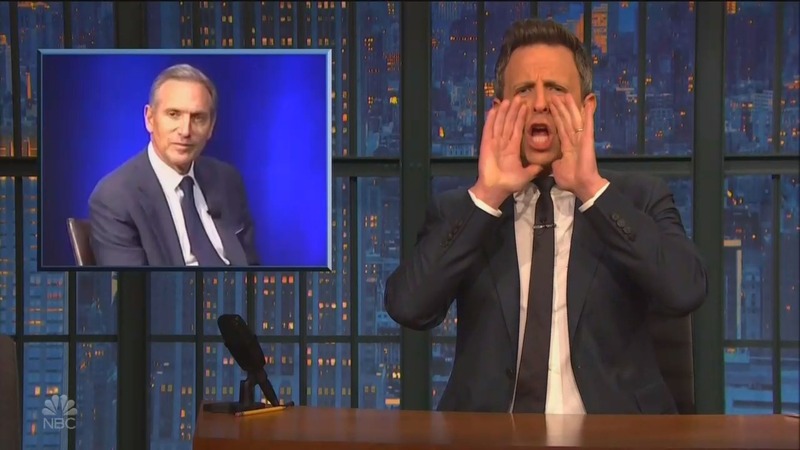 On the Thursday night/early Friday edition of the Late Night with Seth Meyers, NBC comedian Meyers spent more than five minutes essentially giving a commentary in which he mocked and lectured former Starbucks CEO Howard Schultz for criticizing Democrats and possibly threatening his former party’s chances of defeating President Donald Trump. At 12:42 a.m. Eastern, Meyers introduced the “A Closer Look” segment recalling that President Trump has a low approval rating and noting that a numbrer of Democrats “with serious track records” have announced they will run against him. Then came a clip of MSNBC host Andrea Mitchell informing viewers that Schultz is being criticized for the possibility he would split Democraiic voters, followed by a clip of Schultz being called an “a******” by a heckler. Seriously, you think people are going to vote for you — you over them because you’re the CEO of a coffee company? Personally, I’m more of a Dunkin Donuts guy, but that doesn’t mean I’m going to vote for the CEO who I assume is just a drunk guy in a Bruins jersey chucking snowballs off a highway overpass. He then complained about the Starbucks former CEO wanting to “bypass the process because he thinks he’s entitled to it” rather than run in a Democratic primary.